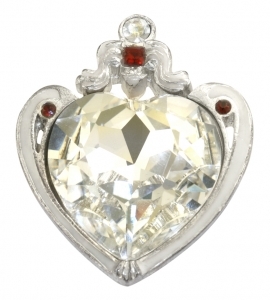 Based on the large and small diamond on the lower band of the small diamond crown of Queen Victoria. Bow brooches have been a popular design since the 1800's, and in May 1858 Garrard (the Crown Jewellers) made a set of three bow brooches, two large and one small, out of 506 diamonds supplied by Queen Victoria. Although taken from the Cypher of Empress Catherine, we can rename it the ‘diamond crown brooch’ and it would look nice in the Jewel House shop as a non-descript jewelled crown. This crown is a beautiful pieces of jewellery cast in lead free pewter, gold toned and set with Swarovski Elements.